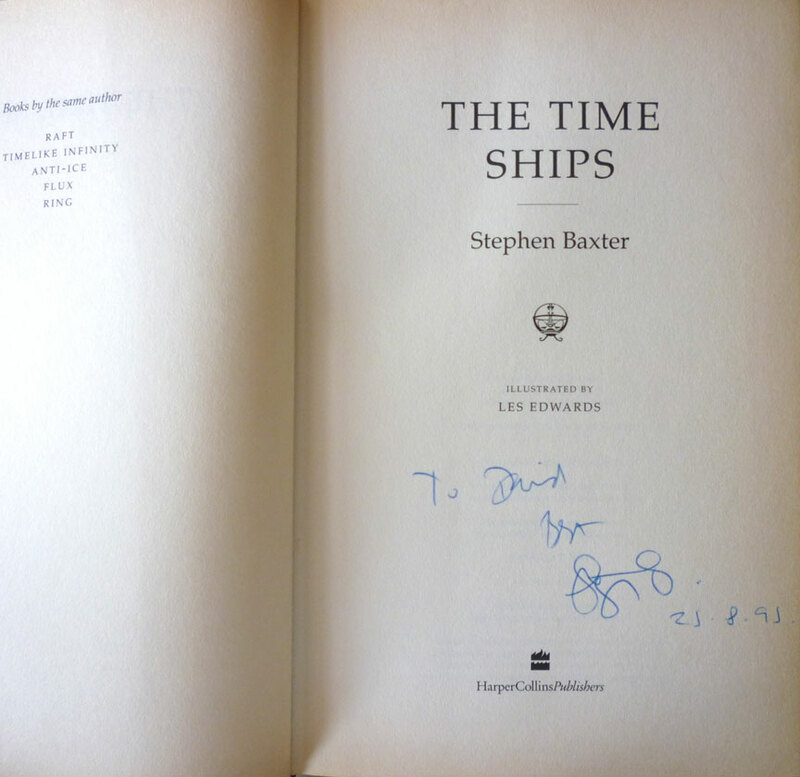 A signed dedication by the author. Now, I don't have a smart phone, so for me secondhand book collecting is still largely a case of guesswork and the occasional piece of good fortune. But when I found this copy of The Time Ships, I had an inkling that first editions/first printings were valuable, and that therefore a signed first/first would be even more so. 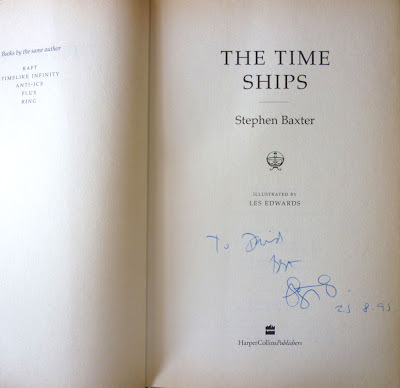 What I didn't know was quite how valuable: AbeBooks currently lists eight signed UK firsts (plus one signed proof) ranging in price from £120 up to nearly £300. Which makes it not a bad purchase at all for a pound, and a piece of good fortune indeed. Incidentally, after being rumoured for a while, it was officially announced in July that Baxter will be writing an original Doctor Who novel, Wheel of Ice, starring the Second Doctor (Patrick Troughton), to be published next year. 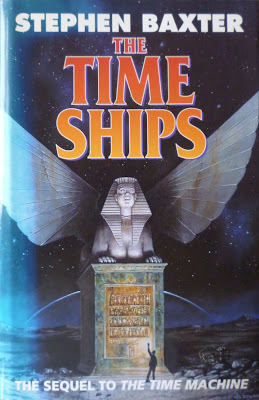 This is part of a concerted effort by BBC Books to attract big-name SF authors to the Doctor Who fiction lines, an initiative which began with Michael Moorcock's The Coming of the Terraphiles in 2010 (Alastair Reynolds is also slated to to pen one). 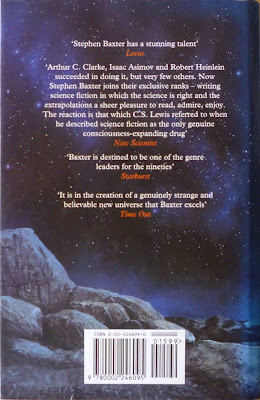 I'm uncertain whether Baxter's book will be published in the same 8vo/Octavo cloth-boards-plus-dustjacket format as Moorcock's novel, as opposed to the smaller self-cover hardbacks that the majority of the Beeb's Doctor Who line is published in these days, but I certainly hope so. And while we're on the subject of Doctor Who, Baxter also provided a foreword to the recently reissued classic Target novelisation Doctor Who and the Abominable Snowmen, which features... the Second Doctor. No prizes for guessing which Doctor is Baxter's Doctor, then.